Hotel Beaugrenelle Saint-Charles i Paris, Frankrike : Boka nu! 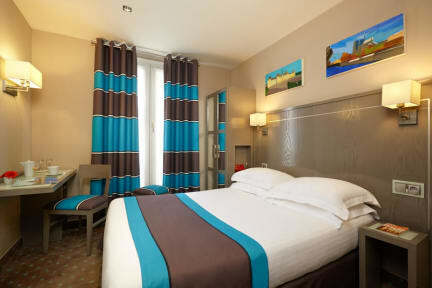 In the heart of the Beaugrenelle business center, between the Eiffel Tower and the Porte de Versailles exhibition Hall, the Beaugrenelle Saint Charles welcomes you with its 50 air-conditioned single, double or twin rooms. 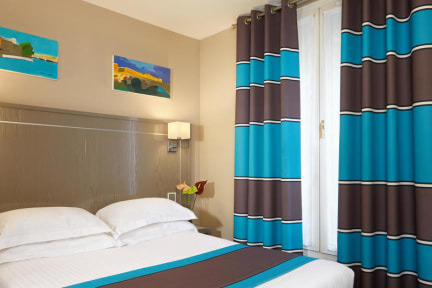 Whether you come for business or for leisure, your comfort is our first priority at the Beaugrenelle Saint Charles. As soon as you arrive in our hotel, which offer you all the conveniences of a modern hotel; you will be greeted by a friendly, helpful staff. To start the day off on the right foot at the Beaugrenelle Saint Charles near the Bois de Boulogne, you can have breakfast in your room or in our artistic designer-style dining room. You will find the same atmosphere in the sitting rooms. But the calmest side of Paris is also at your doorstep with both the Bois de Boulogne and the Champs de Mars. More greenery can be enjoyed as well in our own landscape garden. The location is great as you can walk to the Eiffel Tower in just about five minutes and you can see the tower lit up at night from the road of the hotel. Enjoy the wonderful Beaugrenelle Commercial Center, its shops, restaurants and cinema. Just 2 minutes walk from the hotel. Private and secured parking is available 50 meters from the hotel with an extra cost and upon prior reservation. Please Note: We will pre-authorise the first night after booking in order to guarantee your booking. If the credit card is not valid, the customer will be contacted to provide the details of another valid card in order to guarantee the booking. Failure to do so might result in the cancellation of the booking.